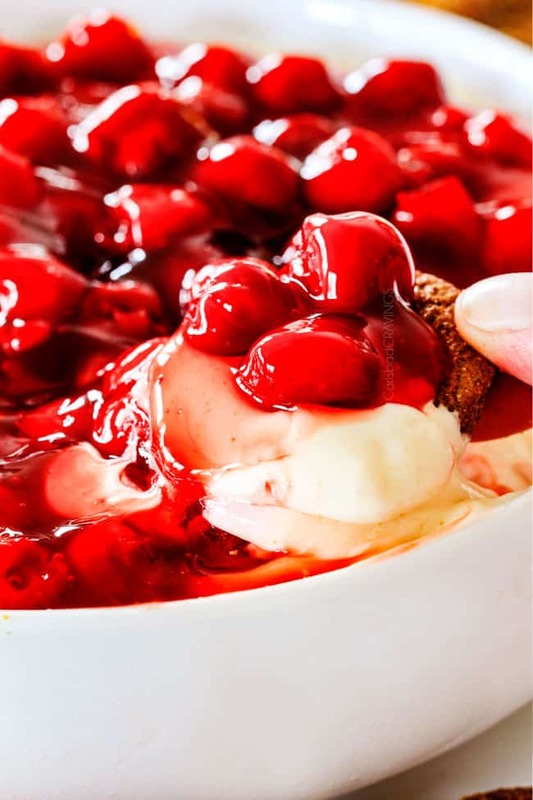 5 MINUTE No Bake Cherry Cheesecake Dip - make ahead, stress free! 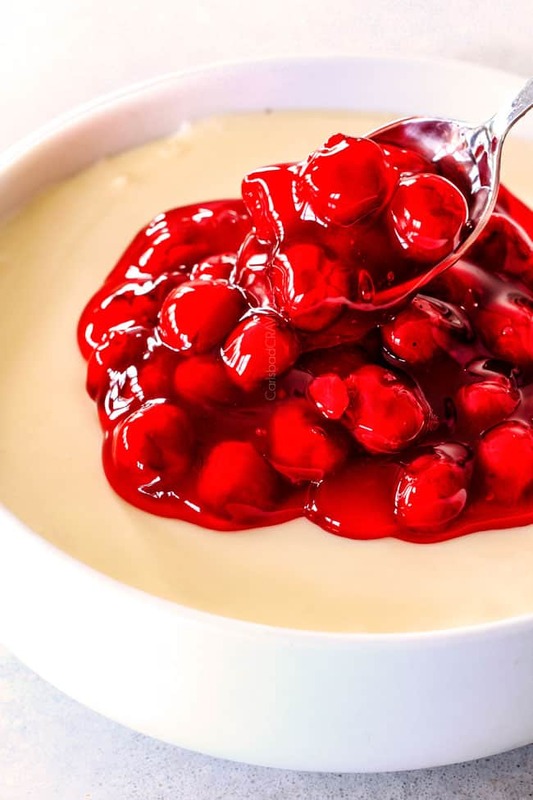 Easy, creamy NO BAKE Cherry Cheesecake Dip is one of the easiest AND most delicious desserts/appetizers that comes together in less than 10 minutes! 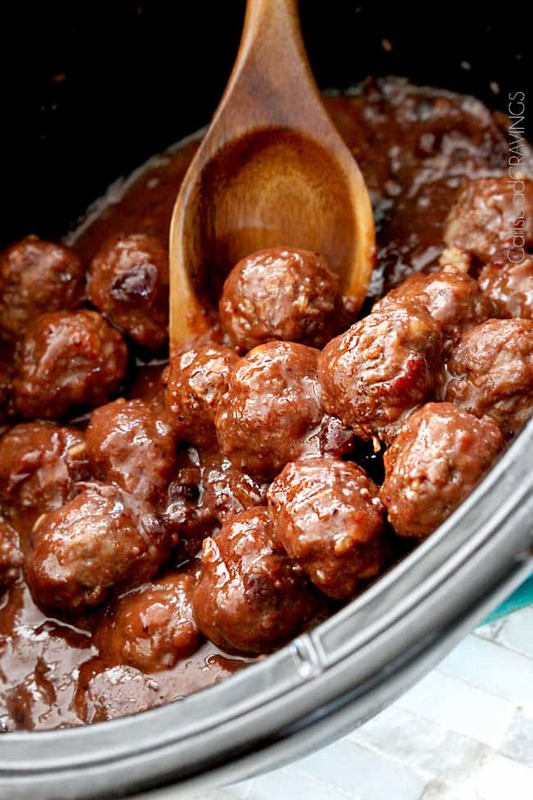 The ideal make ahead, stress free, crowd pleaser for all your holiday parties! 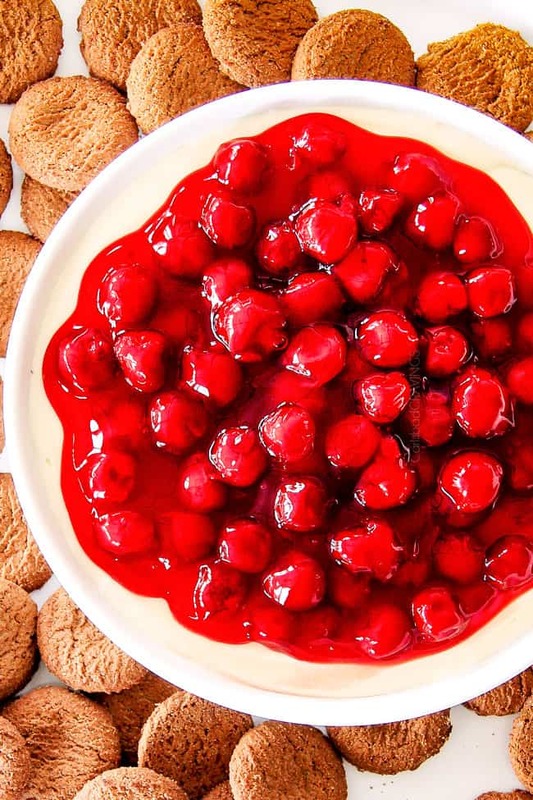 I had no intention of posting this Cherry Cheesecake Dip recipe until closer to Christmas because I have so many other recipes to post before Thanksgiving, but after my husband and I inhaled gingersnap after gingersnap smothered in the luxuriously creamy dip, we both agreed how perfect it would be for Thanksgiving. As I lamented to Patrick that my editorial calendar just doesn’t have room for this dip this month, he said, “but you have to share this before Thanksgiving! It’s the best appetizer AND dessert ever!” And if you knew what a food critic Patrick is, that statement carries a lot of weight. I knew what had to be done. Patrick loves this dip because of the taste. I love this dip – and YOU will love this dip – not only because of the taste but because it literally takes 8 MINUTES to whip together AND is better made in advance so it really is the perfect make ahead dessert = less stress on party day! 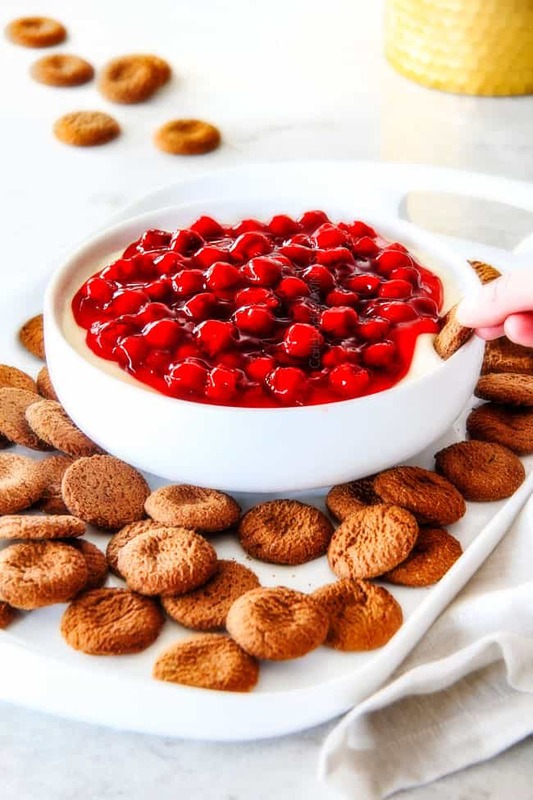 I got the idea for this Cherry Cheesecake Dip from mini cherry cheesecakes I used to make for baby showers, Christmas goodie plates, etc. 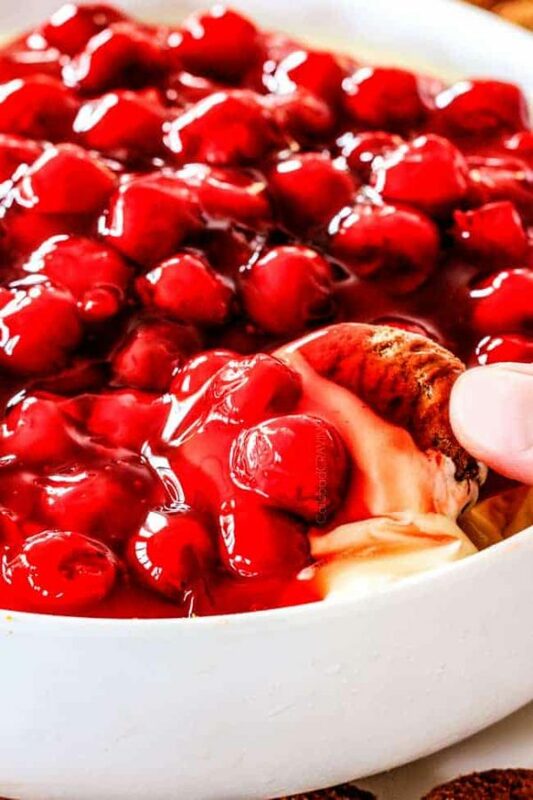 You have probably seen the old school recipe with one saucy cherry, from a can of cherry pie filling, topping a mini cheesecake. And for whatever reason, that chilled cherry crowning that cheesecake is magical. Channel that magic into an even creamier dip and we have crowd pleasing appetizer that is sure to become a staple at all your holiday parties! 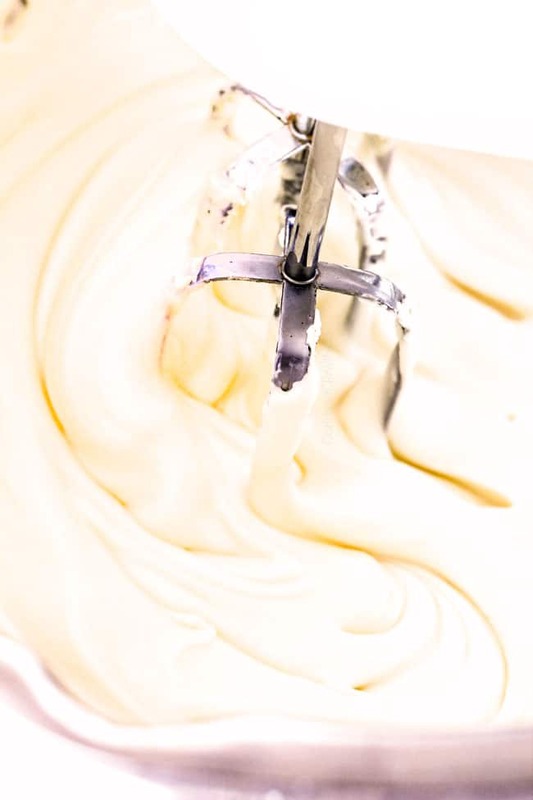 Next, beat your softened cream cheese until nice and smooth then beat in your sugar, splashes of lemon juice and vanilla. Finally, add your sour cream and heavy cream and beat on medium high speed until thick and fluffy, about 3-5 minutes then pour into a serving dish. 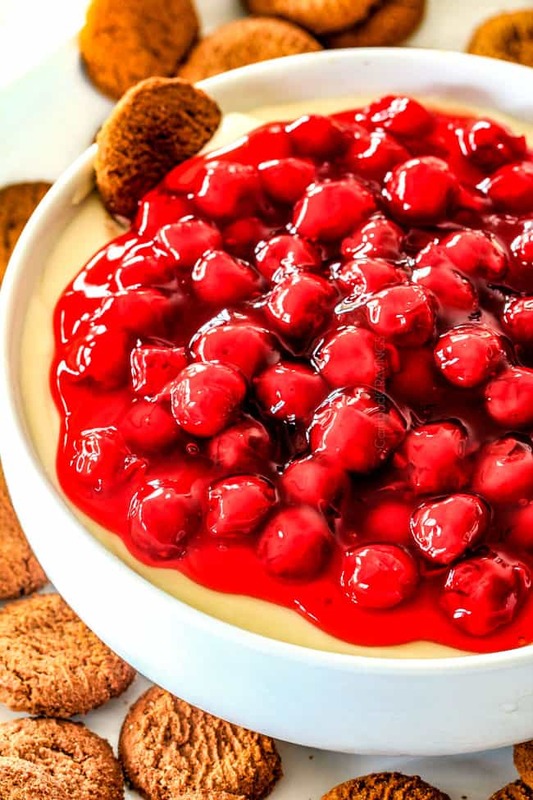 If you are in a bind, you can add the cherries and serve the dip right then but the cheesecake sets up and tastes even better if its allowed to chill for at least one hour – and even better after 24 hours so you can truly make it and forget it until go time. Spoon your cherries over top before serving and you’ve just made the prettiest, delightfully rich yet refreshingly light, talk-of-the-party dessert. And it took you less than 10 minutes. Now that’s a reason to party. 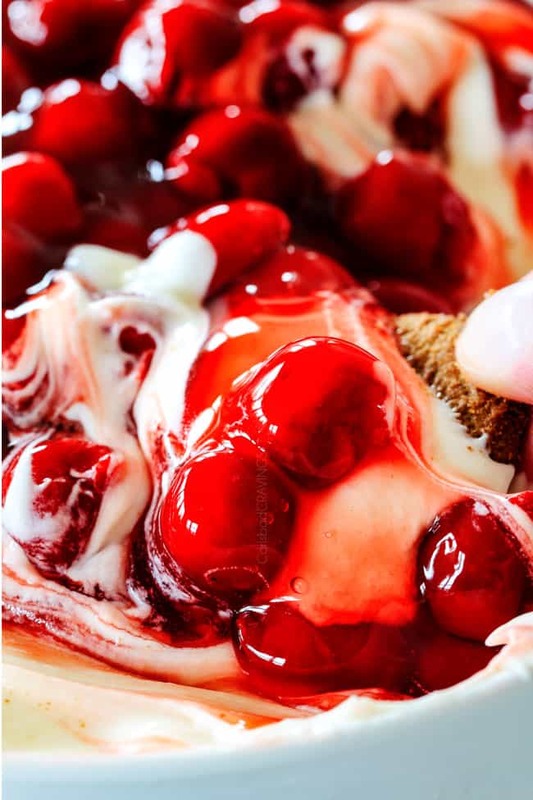 Want to try this Cherry Cheesecake Dip? Pin it to your DESSERT, CHRISTMAS or APPETIZER Board to SAVE for later! Okay, you and your husband are too cute, and thank you for posting this now!! 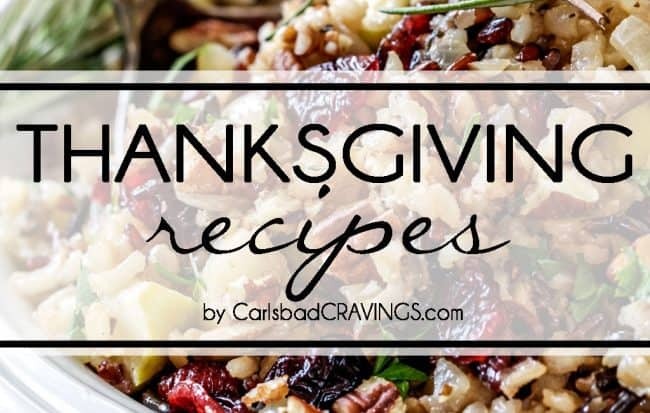 I am adding it to my list for Thanksgiving!!! It looks amazing! ah, thanks for such a delightful comment Deb! I am flattered you check my site often and send recipes to all your friends – thank you so much! You will not regret making this dip – it truly is heavenly! What brand of pie fillings do you use? Can you think of any flavors other than cherry filling that this would work with?! Thanks!! I Use Duncan Hines Comstock. Raspberry and Blueberry would probably work well too. enjoy! Do you think I can use canned cranberry? I personally wouldn’t do it with canned cranberries but if you want it to taste like lots of cranberries and be sweet tart then it can work.